Hear Speech Loud & Clear - Even at a Distance! Enjoy improved listening, clarity, and better understanding of speakers - even at a distance - at work, school and play! The AT-216 Digitally Synthesized Wireless Auditory Assistance Kit from Comtek puts years of experience and the latest digital technology to work, improving your listening experience in a variety of settings and helping you meet the hearing challenges of your active life. This kit includes an Enviro-Mic PR-216 receiver with plug-in environmental microphone that enhances speech discrimination when both environmental sounds and the speaker's voice from the transmitter must be heard together. The AT-216 system functions as a remote microphone for the user, overcoming the greatest listening challenges for those with impaired hearing: high levels of background noise, reverberation effects, and distance between the speaker and listener. In addition to hearing aids with a telecoil, the listener wears the personal receiver and neckloop. The speaker wears the M-216 transmitter. The PR-216 personal receiver picks up the voice of the person wearing the M-216 transmitter, and the neckloop then retransmits it to the hearing aids for clean, close-up sound. If hearing aids are not used, the receiver may also be used with headphones. Now the person with impaired hearing has a direct link to the speaker at greater distances for improved listening, clarity, and better understanding. Rugged Enclosure: The AT-216 system features all-new packaging designed to hold up to the rigors of everyday use. Whether at school, work, or play, the toughness and reliability of the new Comtek AT-216 gives you the assurance that you will hear well in virtually any situation. - The AT-216 system not only works on the standard channels (1-40) in the 216 MHz band maintaining compatibility with other brands, but only Comtek's AT-216 works with the high dynamic range companded channels (41-60) for high fidelity sound reproduction rendering greater speech intelligibility. - The AT-216 system has unique power conservation circuitry which allows a nine volt battery to be used with greater efficiency. Plus it makes possible the highest audio output level ensuring the effective and efficient use of the "T" coil neckloop system. 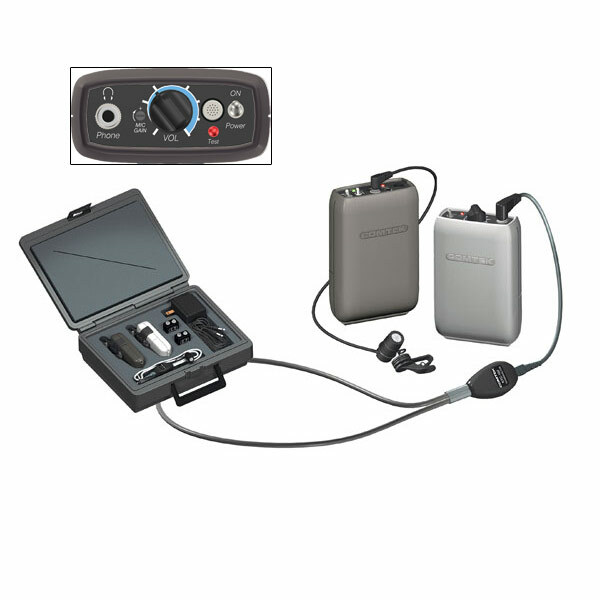 - The M-216 transmitter has the most versatile auxiliary audio input. Transmitting audio programs from tape, CD players, TV, VCR's, or from any audio device which has an auxiliary or line level audio output jack is now easier than ever. What's more, when using the auxiliary audio input, the microphone may also be used to mix voice with the program information for special effects. The M-216's multifunction capability also allows it to be used with compatible telephones and conference table microphones.